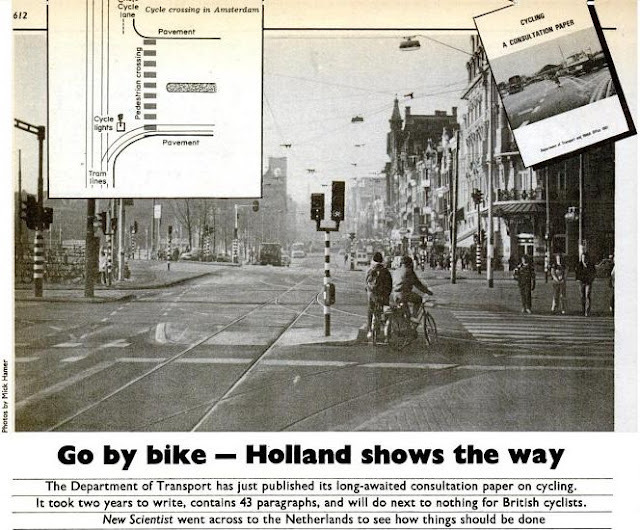 In 1981, when the modern renaissance of Dutch cycling was less than a decade old, Mick Hamer visited the Netherlands for New Scientist magazine and wrote about the cycling infrastructure. He wrote "The Department of Transport has just published its long-awaited consultation paper on cycling. It took two years to write, contains 43 paragraphs, and will do next to nothing for British cyclists." The article goes on: "The key to safer cycling is to segregate cyclists from the heavier, faster motor vehicles that are their main source of danger" [...] "yet segregation is specifically rejected in the DoT's cycling paper". The DoT's (Department of Transport's) paper from 1981 gave the well worn excuses of there being "not enough space" and that it's "too expensive". He also wrote that the consultation paper "amply demonstrates that British thinking lags behind that of its continental neighbours." Yes indeed. And it still does ! Until Britain starts to actually make progress the country will continue to fall behind the standard set by the Netherlands. While campaigners in Britain continue to make the excuse that the Dutch have a head start, the head start simply becomes larger. When this article was published, only eight years had passed since the stop de kindermoord protests which fermented Dutch opinion and caused change to start. The article shows how cyclists are diverted into a bypass behind bus-stops rather than clashing with buses in the same lane. This continues to be the case in the Netherlands as conflict between buses and cyclists is to be avoided at all costs, due to being one of the worst things possible for subjective safety of cyclists. I showed some examples in a blog post last week. 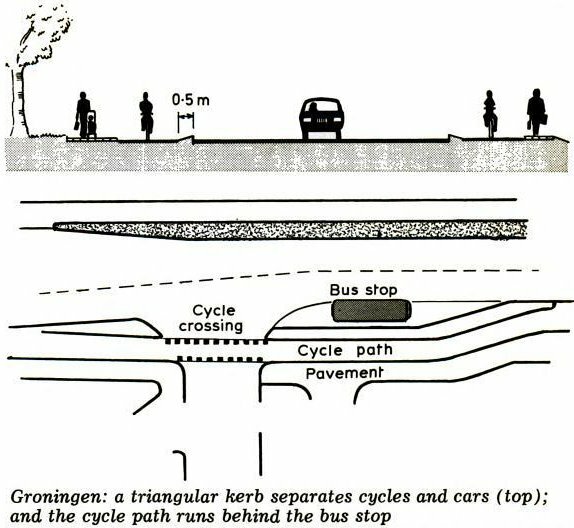 There is talk of a "gentle warning tilt" for cyclists who veer from the path in order to avoid a crash, something which we also see here in Assen in the form of sloped "forgiving" kerbstones. He also noticed that "where there is space, there is a right filter for cyclists just before the traffic lights" and "where the cycle route is parallel to a main road [...] the cycle route has priority over the minor road". The article also points out that it was already known that on-road lanes are not so successful as segregated cycle-paths. It also talks of two prestige "demonstration" routes and includes discussion of how it was already recognized that having too few and too widely spread out routes, even if of high quality, is not effective at increasing cycling. 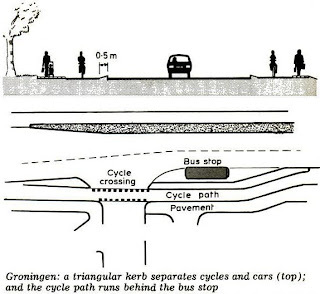 This led to the tight grid of cycle routes which is normal today in the Netherlands. a decline came shortly afterwards (lighter grey). Cycling campaigners in the UK often appear to be members of what a friend of mine calls the "Everything Is Good Committee". There is a perpetual optimism that cycling is increasing no matter what the stats show. This article also talks of an increase in cycling, however at the time it was written, there had been a genuine increase following the 1973 oil crisis. The same had caused cycling to increase in the Netherlands, but while the Dutch used this as a springboard into action on cycling, nothing changed in Britain and the cycling modal share withered once again. Unfortunately, they couldn't make the other optimistic claim that injuries were dropping as they clearly were not. The roads of Britain were not designed to keep cyclists safe. Please read the article in full. It cuts straight to the point, and describes what was wrong with British policy on cycling in 1981. Unfortunately it could also be said to describe what remains wrong with British policy on cycling thirty years later. If you care about cycling, this perhaps will make you angry. Thirty years ago I was a 15 year old who had for some years had independent mobility because I rode my bike to school, to go out and to visit friends. At this age I was completely unaware of the differences between different countries for cyclists, or that I was in more danger than I should have been due to an indifference to cyclists on the part of politicians and designers which fed its way into how British roads were built. These days, I'd be a rarity. In the last thirty years, the rate of youth cycling has plummeted in the UK and other English speaking countries. Even walking has dropped as the car marches ever forwards. Parents have assumed a role of being taxi drivers for their children. Without youngsters cycling, where will new cyclists come from ? The government seems not to be too worried. Their solution appears to be to stop gathering the data on how children get to school. Cyclists continue to die in greater numbers than they need to on the streets of London and the UK in general. In thirty years, much could have been done to improve the safety record of British streets for vulnerable road users, but that has not been done. More importantly for public safety, people continue not to cycle in the UK. The cost of illness and death due to obesity is extraordinary, and cycling is part of the solution as well as being far less costly than dealing with the consequences. How long do British people have to wait until British roads start to resemble Dutch roads ? I think it's obvious that it isn't going to happen by itself. The only way to get this change is to fight for it. Unfortunately, the New Scientist article did not cause the outrage that it should have done. Not enough people asked "why don't we have what they have". Thirty years later, with cycling having declined since that date, but with communications having improved, perhaps more can be achieved. The Cycling Embassy of Great Britain came to see Dutch infrastructure for themselves. They are actively campaigning for infrastructural change in the UK. If you're British, please support them. Other countries need to form similar organisations. Only by organising yourselves will change occur, and sometimes it won't come by working within existing organisations which have a different view of cycling. Cycling should not be just for young adults prepared for battle on the streets. It should not require a high level of fitness or training. People with disabilities have much to gain from better infrastructure. The safety of children is a very strong campaigning issue and linked to better infrastructure. Cycling should be for everyone. We'd be very interested in feedback from Mick Hamer, who remains a consultant to New Scientist magazine, or indeed from anyone else who works at New Scientist who might like to come over here and take a look. We've much to show. Perhaps it's time for a follow-up article. We run study tours specifically to show how infrastructure in the Netherlands works, and how it is an essential part of having such a high cycling rate. If you want inspiration about how cycling could be, come and see for yourself. Thanks to Mark Wagenbuur who found this old article when looking for something else but let me write about it. The article presents 30 year old cycling provision in the Netherlands in comparison with that which existed at the same time in the UK. While the UK hasn't changed much, Dutch cycling provision has moved on considerably in the last 30 years. Almost all of what was seen in 1981 will have been replaced and improved by now. Progress is rapid. Assen isn't unusual amongst Dutch cities in trying to renew all cycle-paths and roads regularly. In this case every seven years is the target. The upshot of this being that a very good part, almost certainly over half, of the kilometres we ride in Assen now are on infrastructure which is new or improved since we moved here four years ago. I recall the Ambassador's Cycle Route. It no longer has that name but still exists, marked on the TfL London Cycle Guides. It was incorporated into the London cycle Network (another, bigger, never-finished "broken promise"). I think it ran from Belgravia or Chelsea Bridge to Paddington, and the main facilities it introduced, which are still used, are the cycle crossing of Knightsbridge at Albert Gate, cycling allowed in Hyde Park (Rotten Row and Broadwalk), and the cycle crossing of Bayswater Road at Albion Street. It remains one of the better, and better-used, LCN routes, showing how little we have progressed in 30 years. Being based on a higgledy-piggledy selection of backstreets, heavily parked, with poor capacity, no dedicated space for cyclists, and lack of priority at junctions (very much the philosophy of the LCN), it was never capable of "promoting" cycling in an attractive, high-visibility fashion that, for all their faults, at least the Cycle Superhighways were intended to do. Incidentally, I now think, after reading this, that Mick Hamer could be the man I referred to in my blogpost Cycle infrastructure: fighting over scraps in the third paragraph from the end. If so, I think his views did have some influence in the long run. According to the Westminster Cycling Campaign, the "Ambassador Route" still exists as route 5 of the London Cycle Network. While I was aware of the existence of the LCN, I have never heard of the Ambassador Route before, nor seen it signposted as such, although it goes through Belgravia which has a lot of embassies so the name is sort of relevant. I am depressed and inspired in equal parts! Thanks for sharing this fascinating insight in to our campaigning history David & Marc. I second ibikeLondon's sentiments. In the UK we've spent decades doing the same thing and expecting different results, or trumpeting a continued steady decline as a victory. Bah. Very good post - as ever. Are there any figures on cycling modal share in the Netherlands when cycling there was at its 'darkest hour', I'm guessing sometime in the late 60s or early 70s. Was it down to the 1-2% level, or a little higher? It's an interesting question since we here in the UK have seen cycling effectively extinct for a generation or more (for all the reasons you present). Cycling has no political constituency any more, and cycling is still regarded (with a few exceptions in places like Cambridge) as odd and very much a marginal pursuit. 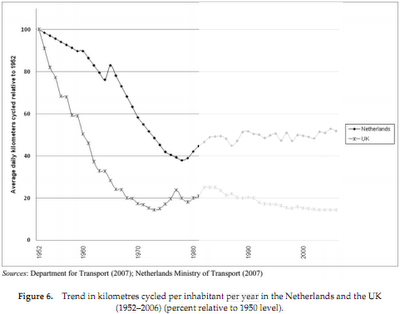 There may have been a decline in cycling in the Netherlands during the 60s but did it ever reach such a low? Or did the authorities and the campaigners have 'something to work with' when they embarked on their renaissance? I'd be interested to know more. Jack, cycling in the Netherlands never reached the low point that it has in the UK. Action was taken before this could occur. However, for cycling to grow, existing cyclists are not the target. Cycling has to become attractive and relevant to those who don't cycle. The entire population is the constituency, not just the minority who already cycle. This is why it is important to spread the appeal of cycling beyond dominance by a certainly subset of young adults. Children are a very good starting point, and their safety is important to everyone. It's also important to emphasize how good cycling infrastructure can improve the lives of people with disabilities. Even drivers benefit from proper cycling infrastructure. So do >employers, and there are very good reasons why doctors should support it. Keep doing this and before long you have a very long list of people who benefit from proper cycling infrastructure, and a very short list of those who don't. That's how you make the constituency for whom this is important big enough that proper measures will be supported. By 'constituency' I mean the people who will support and vote for politicians who force through the pro-cycling measures you describe - often against the powerful opposition of the motoring lobby. In 2011 what are the political rewards for politicians who promote cycling in the UK? The absence of obvious political payoffs explains why all but the most 'conviction' politicians just don't do it. That and the mistaken belief that if you do something for one mode of transport you are automatically going to incur the ire of others - though it should be said that good cycling infrastructure invariably means turning motor vehicle space over to cyclists. In the Netherlands in the 1960s there were still a significant (though declining) minority of people riding bikes and they could be expected to reward politicians who made their lives better by introducing good cycle infrastructure - which would in turn bring non-cyclists into cycling, reinforcing a virtuous circle. In the UK, if we do as you say and discount existing cyclists, we are talking a political strategy that involves mobilising theoretical cyclists - people who currently don't but might if the conditions were better. Good luck with that. The political payoffs are much more uncertain than in the Netherlands where mass cycling never died. I think this context is useful so people realise the GB/NL analogies are not as clear as you and others sometimes present and that here we face a different, more difficult challenge. A small proportion of the 2% of existing cyclists banging their fists on the table saying 'we want what the Dutch have got' does not look like an obviously winning political strategy to me. But I do hope I'm proven wrong. Jack, no popular movement ever has everyone writing policies and gathering support. You're looking at a very small part of the picture. It's always a small number of people who write, say, a political manifesto. They then set out to get enough people in the country, perhaps even a majority, to support their ideas that they will achieve power. It's just the same with changing infrastructure. It's not about "cyclists" whether banging their fists on tables or not, but about finding policies which get mass support. This, BTW, is also why it is important not to be anti-motorist. The Netherlands didn't achieve its high cycling rate by punishing drivers and there is no need for Britain to do so either. For cycling to grow, you need to engage people. Forget about "cyclists" - they'll cycle anyway. To get everyone to cycle you need to make it something attractive and convenient. Talk about the safety of children, the convenience of disabled people etc. as I suggested in the list I posted a few minutes ago. This gets you some way to having decent infrastructure for all. However you feel about it, what's the choice ? The only other thing which can happen is for that tiny minority who already cycle to carry on talking about their own rights, and to carry on being marginalized because too few people care about this issue. This approach has been tried. Britain has the result of decades of doing exactly this. The result is the problems that Britain's cyclists face. Another inspirational post which should be required reading, well, for everybody! Thanks. Also grateful for the reminder of the idea that the campaign in the UK should perhaps not be about cycle paths per se, but about "stopping the child murder", solving the problem of the "lorry killers in out towns" or turning back the tide of the "obesity time bomb". In other words, something that everyone can support. It's sort of the chicken or egg question. How do you get a network of good quality bike infrastructure installed when the great majority of the populous doesn't ride a bike regularly. The resistance to taking away parking spaces or street lanes can be fierce, as L.A. is just beginning to experience with the beginning implementation of it's new bicycle plan. Closing some streets down on weekends to have a Ciclovia is a terrific way to get people to cycle before there is a great deal of infrastructure to encourage it. Los Angeles has had three CicLAvias since last October and it's having a remarkable impact in getting people to think in a positive way about bicycling as it encourages people to get outside to explore the city by bike. Last Sundays expanded CicLAvia had a crowd estimate from one television station of 130,000 people who were mainly riding bikes. So far, there has been mostly rave reviews from people in L.A. about the events. The reason so many people can show up on bikes without adequate bicycle infrastructure is that the organizers were smart enough to keep it near mass transit rail lines. Metro not only allows bikes on rail at all hours, but for this Sunday event, they made the trains the same length as peak hour travel times during the weekdays. Another plus is that Ciclovia encourages politicians to get on a bike and participate. Which also shows them what can happen when there is a comfortable place for people to bicycle. The idea that people will not bicycle in the Los Angeles area in great numbers is absolutely disproven by the growing number of people participating in this event. Another plus of having a Ciclovia is that after people get thirsty and hungry from riding, they visit the local restaurants and stores. This supports the local businesses and brings in money for the city from people that not only live in the area, but from people who live outside of the city. The businesses at first did not see how closing down the streets for cycling would benefit their stores, but when people showed up in great numbers to buy from them, they became very supportive. I agree entirely with your recipe for moving forward in the UK and think that is exactly what the more active borough groups of the London Cycling Campaign are doing. For instance, my local group, Southwark Cyclists, has strong working relationships with Living Streets, with the local NHS through it's accessible 'healthy rides' programme of easy rides aimed at older cyclists, with schools through Bikeability, with local businesses, minority and arts groups and so on. Reaching out beyond the cyclists, if you will. Look at how members of the London Cycling Campaign voted when asked for their views on the LCC's mayoral election manifesto. To describe the CEoGB, a small group of very nice and very intelligent bloggers with a website, as 'the best hope for British cyclists' is to do a huge disservice to the kind of people who I see around me actually doing the kind of things you're talking about. It's just a very long row to hoe because Britain suffered a cycling extinction that lasted decades. I'm an ex-CTC officer who also campaigns locally having re-established a local cycle campaign group in Worthing, West Susex and also set up a Cycle Town Forum for local cyclists to engage with the police, local councillors etc.We get involved with local Sustrans reps holding family cycle days on the seafront and managed to get cycling re-established on Worthing Prom as Shared Use, which is now heavily used by people of all ages. Our Board comprises people who campaign extensively - in particular David Arditti, who has campaigned with LCC for years and Sally Hinchcliffe in Dumfries. Together we have held meetings in London and Manchester, paid out of our own pockets to go and actually see Dutch Infrastructure in context with the very able Mr Hembrow as a guide (as opposed to the British practice of looking at Google Streetview and assuming you know what the Dutch mean). We have supported LCC's Blackfriars Bridge Campaigns and flashrides (particularly through the continuing hard work of Mark Ames). At the very least, we have got people talking and thinking about 'going Dutch' (and Danish of course!) and hopefully we will continue to dispell the myths along the way. What you're doing in L.A. gives me hope for the future for New Jersey and NYC metro. For my fellow travelers on two wheels --the wheels that click rather than roar-- in those parts of the world where cycling is so marginalized, let's also focus on a simple and painfully overlooked obvious proposal: let's provide more bicycle parking. We need a place for the bike for when we arrive. From there we can expand our constituency to start bigger projects, better infrastructure, and more inclusive transport. I'm trying to introduce my council to the concept of planned maintenance. When you say that many Dutch cities aim to renew their roads and cycle paths every seven years, where does that information come from? Do you have a reference document for that, such as a policy document published by national or local government? Robert, sorry but I have no document for this. I was told it by a local official just after we moved here six years ago and since then I've watched as roads and cycle-paths were renewed. This is little still left from before we came here. Some parts have been done twice. "I am angry that, whereas Olympic lanes can be built overnight, there has been no spade into the ground to implement the London Mayor's cycling vision, whilst in the meantime more people on bicycles are being killed and injured."